Manila, Philippines - The San Mig Coffee Mixers won the 2014 Philippine Basketball Association (PBA) Commissioner's Cup against Talk 'N Text at the Game 4 of best-of-5 Finals series on Thursday, May 15, 2014 at the PhilSports Arena, Pasig City. The San Mig Super Coffee Mixers defeated Talk ‘N Text Tropang Texters for a 100-91 victory to win the PLDT Home TVolution Commissioner’s Cup and has achieved their third straight PBA title. The Talk ‘N Text started out like a house on fire, opening the game with a 17-1 score. It was the duo of Mark Barroca and James Yap which turned the tied in favor of the Mixers in the pay-off period, taking over the Mixers offense to win the series, 3-1. It was a come-from-behind championship victory for coach Tim Cone and his wards as Cone made history once again in the Philsports Arena with his 17th PBA title. "At halftime, I screamed at the guys, I yelled at them, told them, 'You want to rest already for Game 5?, Tim Cone said. "I'm amazed, I thought they can't do it, but this team has proven me wrong over and over again," Coach Time Cone added. 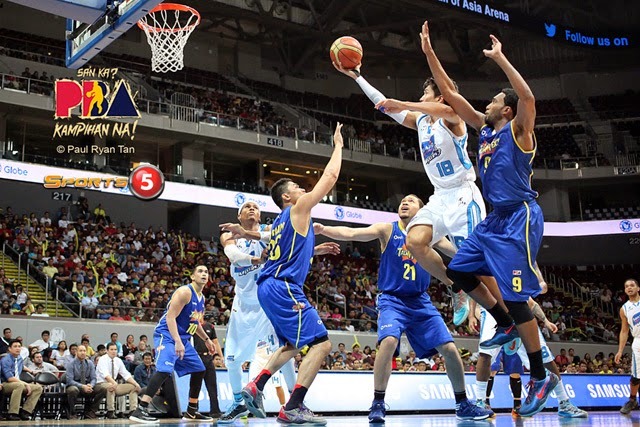 San Mig Super Coffee Mixers superstar James Yap was named the Finals MVP of the 2014 conference. Jayson Castro of Talk N Text was named Best Player of the Conference while Richard Howell also from TNT hailed as Best Import of the Conference.